« Prevention Link’s Spring Mega School will be held at Fern Resort in Orillia! 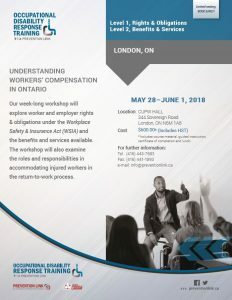 Join Prevention Link for a week-long workshop that will explore worker and employer rights & obligations under the Workplace Safety & Insurance Act (WSIA) and the beneﬁts and services available. From May 28 – June 1, 2018, we are pleased to offer our Occupational Disability Prevention Training Level 1 and 2. Cost: $600 * Includes course material, guided instruction, certiﬁcate of completion and lunch. Download the registration form for ODRT Level 1 & 2: London.